In a new study published this week in Stem Cell Reports, a team led by UW ADRC researcher Jessica Young demonstrated the power of using lab-grown cells made from Alzheimer's patients skin cells to discover therapeutics and preventions for Alzheimer's disease, the leading cause of dementia. They showed that a compound that enhances the trafficking of proteins within cells reduced the production of two Alzheimer's proteins implicated in brain cell death, which may point to a therapeutic strategy against Alzheimer's disease-type dementia. Young explains the significance of this finding in the below video. To learn more (and if you are still wondering what induced pleuripotent stem cells are!) continue on to 'Presto Change-O! Neurons in a Dish' - an article that delves deep into this cutting-edge area of research. Human-derived stem cell technology promises to accelerate the search for Alzheimer’s disease therapeutics. Come travel to the edge of a scientific frontier with a writer who literally has some skin in the game. Whenever I catch sight of the small pockmark on the inside of my left arm, I remember: In 2013, I donated a skin biopsy to research. 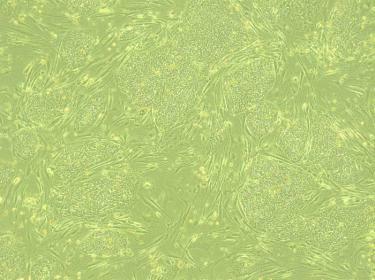 The cells I had removed are still alive, but they’re no longer skin cells. They are now brain cells. Billions of my neurons grow on Petri dishes, housed in incubators in brain research labs across the country. First, the researchers dropped my cells into a dish of nutrient-rich broth and let them grow for a few days. Then, using a Nobel Prize-winning genetic engineering technique, they reprogrammed my skin cells into stem cells. These cells, called human induced pluripotent stem cells (iPSCs), have the ability to replicate themselves and grow into any other type of human cell. Even its practitioners in the lab say that the cellular transformation that follows seems like “part magic.” A dose of chemical growth factors instructed my stem cells to take a specific pathway of development: they sprouted branching dendrites and axons, formed synaptic connections, and sent electrical signals to their neighbors. Presto-change-o! They had differentiated into working neurons. So what do researchers do with such a boundless supply of neurons? Here at the UW ADRC, the application of iPSCs technology to neurons has recently become a powerful tool to study the causes of Alzheimer’s disease and improve the search for effective treatments. Most cases of Alzheimer’s disease-type dementia result from a mix of genetic, environmental and lifestyle factors. Overall, people over 65 have a 10 percent risk of developing symptoms. That level of risk varies in subtle ways across individuals. Consider that about 20 gene variants are known to confer low levels of increased risk for Alzheimer’s disease, while others endow resilience. These variants do not cause disease on their own; rather they make it more or less likely to occur, in the context of life influences. Importantly, this variability means that every person may respond to therapies and interventions differently. This human complexity also makes it difficult to study the mechanisms of Alzheimer’s disease in model organisms. Mice and worms bred to carry rare genetic mutations have revealed a lot about the mechanisms of the rare forms of Alzheimer’s disease that run in families. But because sporadic (un-inherited) Alzheimer’s disease in humans lacks a very strong genetic component, researchers can’t make a transgenic mouse model. 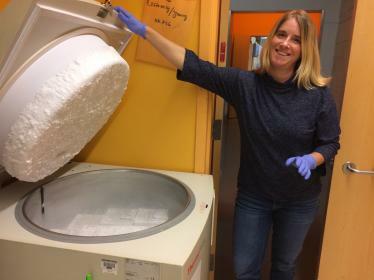 In Young’s lab, based at the UW Institute for Stem Cell and Regenerative Medicine (ISCRM), a storage unit contains shelves of Petri dishes full of microscopic cells, sustained at 98.6° in a pink liquid of sugar and amino acids. Her team is generating iPSCs-derived neurons from people with and without symptoms of Alzheimer’s. They use these cells as ‘disease-in-a-dish’ models to ask questions they can’t with a mouse. How does an individual’s unique genetic background contribute to risk? Which genotypes respond to which classes of drugs? The idea is to identify therapeutic targets and establish ways to match people to the clinical trials most relevant to their underlying condition. In fact, Young has already demonstrated an example of how the iPSCs process can work in a precision medicine approach to Alzheimer’s disease. Young focuses on a gene called SORL1, an important actor in a cellular pathway that processes amyloid beta and prevents it from building up in toxic clumps in our neurons. That pathway works better in some people than others. Scientists have identified variants of SORL1 associated with increased risk of Alzheimer’s after age 65, and some that confer a protective effect. These are common variants in the U.S. population. In previous work at the University of California San Diego, Young made neurons from the skin cells of people who carried one or more of these SORL1 variants. She treated the neurons with a compound, “brain-derived neurotropic factor” (BDNF), that induces the activity of SORL1. This is a change that would, in theory, boost the cells’ ability to deal with amyloid beta. She found that the neurons behaved differently depending on their SORL1 genetics. The ones with the protective variant showed a robust response to BDNF. They ended up with low levels of amyloid beta, as compared to the neurons carrying the risk variant. The cells carrying the risk variant, on the other hand, responded better to a different experimental compound. She and her team are now using gene-editing technology, called CRISPR, to snip out the SORL1 gene from iPSCs-derived neurons, in order to learn more about the impact of its loss. In collaboration with pharmaceutical company Biogen, they will try to target parts of this pathway for treatment. In parallel, Young is working with the ADRC’s Dr. Suman Jayadev, Assistant Professor of Neurology, UW Medicine, to engineer methods to create iPSCs brain immune cells from patients carrying a familial gene mutation. 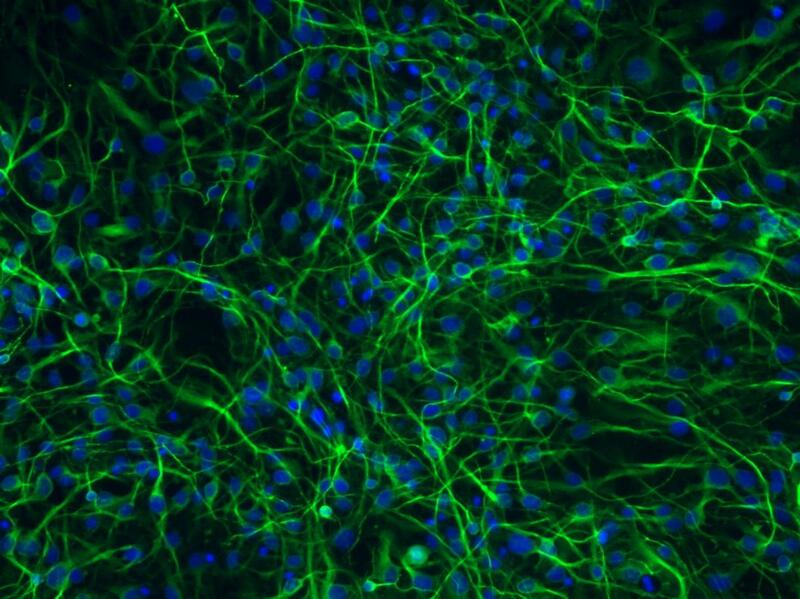 Jayadev’s lab will find out how these cells succumb to inflammation and secrete toxic chemicals that make other brain cells sicker—and how to halt this process. To develop a truly complete laboratory model of sporadic Alzheimer’s disease, researchers need to know how accurately the iPSCs neurons represent the disease process in the actual patient. There’s only one way to find out. They need to analyze the cell donor’s post-mortem brain tissue from autopsy, which gives definitive proof of Alzheimer’s disease proteins. Fortunately, the ADRC’s Neuropathology Core, led by C. Dirk Keene, Associate Professor of Pathology, UW Medicine, offers the perfect resource in its protocol of rapid brain autopsy (one happening < 8 hours after death) for ADRC research participants. 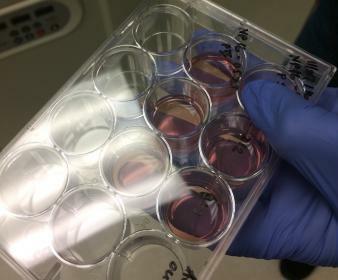 Keene and his team have started to collect cells from each participant during brain autopsy, for the creation of iPSCs. They take samples of leptomeningeal cells, which form a type of connective tissue on the outer lining of the brain. Many of these cells are still alive at this point, so Keene and Young think that they can be differentiated into neurons. Together, they will create a bank of iPSCs from ADRC participants. “What’s amazing about this project is that we will have autopsy confirmation of Alzheimer’s disease and clinical records to go along with the iPSCs neurons,” says Keene. “So, cell biologists will be able to compare what they see in the living cells to what neuropathologists see in the post-mortem brain tissue.” Then, they will have higher confidence in their Petri dish model.